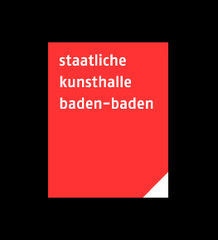 As an internationally renowned exhibiting institution, the Staatliche Kunsthalle Baden-Baden is among the oldest cultural centers of the city and region. It has served as a showcase for classical, modern and contemporary art since 1909 and is sponsored by the State of Baden-Wuerttemberg’s Ministry for Research, Science and Art. Each year, the Kunsthalle puts on four to six exhibitions – solo exhibitions dedicated to individual artists as well as group presentations dealing with contemporary or historical art and cultural issues. Ambitious exhibition catalogues and exhibition events are always part of the picture. As the Kunsthalle does not house an own collection, it can take great liberties in designing its programs while also reacting quickly and flexibly to new currents in the art world. Indeed, over the past years, it has evolved into a much noted forum in which immanent issues can be addressed in a topical yet historically-grounded fashion in connection with artistic analyses. In doing so, the Kunsthalle has succeeded in attracting a broad spectrum of visitors with a diverse range of interests. With its sophisticated alternating of small rooms with larger ones, collections that are swathed in unobtrusive lucidity by the splendid skylight and the refined simplicity of its architecture, the Staatliche Kunsthalle Baden-Baden could never be overshadowed by the many so-called “star” constructions” of a later era! In fact, the abundance of exalted modern museum constructions today gives rise to a yearning for the calm and focused clarity of the rooms of the Staatliche Kunsthalle Baden-Baden.